Now, when I say I’ve been drinking, I don’t mean like, “WOO! Let’s tie on a few more, boys!” like crazy woah. I mean I’ve had a beer. One beer with dinner. I know, I’m a lightweight. It’s sort of sad and adorable (or so I’ve been told). Remind me to tell you the story of how I drank ‘four beers for AMERICA’ one fourth of July. Actually, nevermind, that story ends like you think it does. I like beer. Our beer of choice is called Shiner Bock. It comes from Shiner, Texas. The brewery is like 100+ years old, started by this German and Czech family. The beer was pretty well known in Texas when I was living there, but not really outside of it. Bocks are lagers, but this isn’t like your Bud Light or your Labatt or other really popular lagers. Bocks are darker. Actually, darker makes me think of Guinness. It isn’t like that. It’s just a well balanced beer. Very tasty, especially cold. We drank and enjoyed our Shiners. It was the beer of choice at parties. We went to a five course dinner at Ruth’s Chris that had a Shiner pairing menu. We visited their brewery. We even bought some bar art and had it framed. When we got married six years ago, we were shocked and excited that the inlaws were able to find it and have it at our wedding. It was pricey but the guests enjoyed it and we were happy to have a little bit of Texas in Michigan. Note our delight as we are handed cold Shiner beer on a summer night where we are wearing like four layers of clothes. 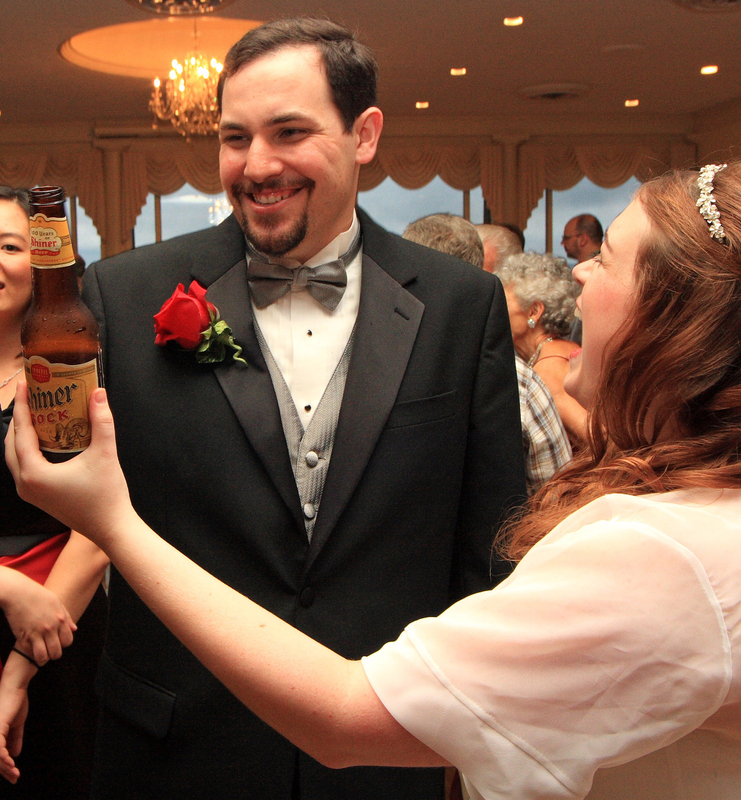 As the years past, we started seeing reports of friends from all over the country who had found Shiner and enjoyed it in their home state. Eventually we could find it at Kroger and Meijer here in Michigan. We were floored. I’d like to think that the wedding had something to do with it. 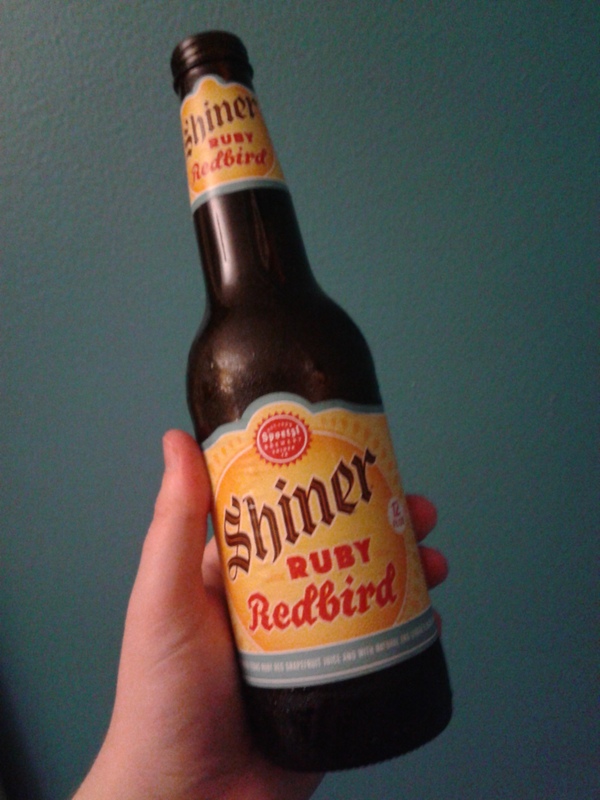 This evening, I’m enjoying Shiner’s Ruby Redbird. Shiner does seasonal beers and this is their summer jam. IT IS TASTY. There is NOTHING better on a hot day than drinking an ice cold Ruby Redbird. The flavor is Ruby Red Grapefruit (from Texas, natch’) and ginger made into a delicious beer that is crisp and refreshing. I hate grapefruit, but I love this beer! 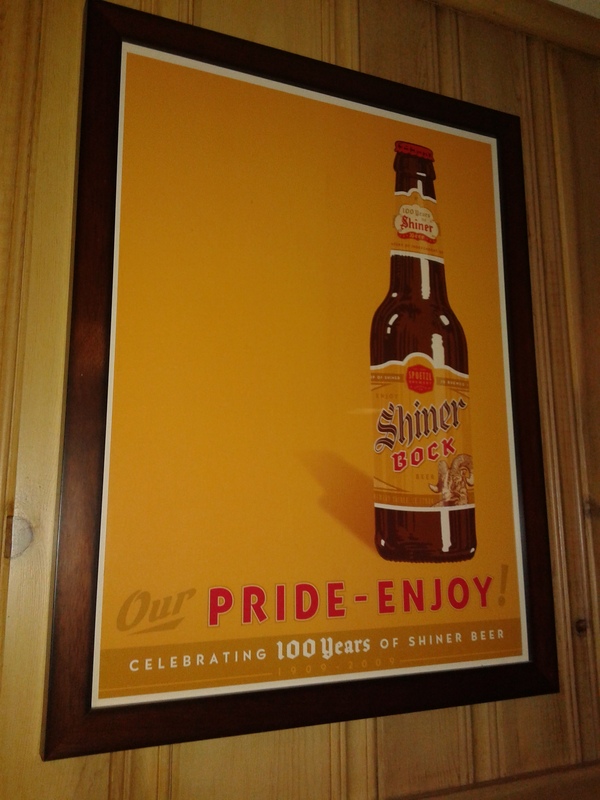 Before Shiner started to be popular, you couldn’t get the specialty beers anywhere but Texas. A couple summers ago I found them here in a Meijer and I: a. freaked out then b. bought every six pack they had. It miiiight have been before 11am. I might not have cared. I just finished my beer. It was good. If you like beer, you’d probably enjoy it. You can find it in most specialty markets, but sometimes it’s in the cold beer aisle in Kroger, next to the Shiner Bock. Give it a shot. And thanks for not being judgey about the whole ‘posting on my blog when I’ve been drinking’ thing. We’re cool, right? Yeah. So cool. Everything is cool. Except my face. My face is warm. What were we talking about again? Let me tell you about ladybugs and forts. When I was halfway through elementary school we moved “out of town” – which was only fifteen minutes away from “in” town. Still, it seemed we’d immediately jettisoned ourselves to the country. The area was a brand new subdivision and still very much ‘under construction’. Most of the roads in and out were just dirt, and the house plots only home to real estate signs and huge swaths of a plant we called honeysuckle (dalmatian toadflax, a weed). A lot of summer days of my childhood were riding through those endless plots and weeds on my bike, picking the flowers off the honeysuckles, sucking the nectar out, and make swords out of their long, woody stems. A few houses had sprung up near ours, wooden skeletons looming in the distance. We would investigate them on the weekends in the summer, when the workers were absent and the daylight seemed to last forever. We’d play games and climb the unfinished stairs and talk about what we thought the finished houses would be like. Our parents told us not to, and sure there were a few falls through open unfurnished holes into the basement, but we always crawled up out the window wells and never told a soul. It’s remarkable no one broke their leg. Among the amber waves of weeds and yet-to-be-filled domiciles was a small hillside next to our home, known ominously as THE HILL, with an industrial trash heap at the top. WHY was there an industrial trash heap in this newly forming neighborhood? WHO KNOWS. It, too, was verboten but we adventured there on our bikes anyway. We suspected the developer didn’t much care about what happened to the trash so it all ended up there. Tree stumps, metal tubing, wire, buckets, unknown discolored plastics baking in the sun… I’m sure we risked life and limb going into the heap, but we did. The BEST PART was the pile had been stacked in such a way that it actually made an enclosed cave you could enter with different little “rooms”. That part was mostly giant pieces of tree and tree stumps. I’m amazed we never had an issue with ticks. We pretended it was our fort and we’d truly moved OFF THE GRID, into the WILD. We had a club that was disbanded almost as quickly as it was formed, due to a breakdown in communications over what the “secret password” was. It spent a good deal of time as a spaceship as well. It was the perfect playground. One day, us neighborhood kids gathered and headed up to the heap at the urging of one of our own. Something odd was in the heap. We parked our bikes at the top of The Hill and looked out on the pile. A young tree had sprouted straight up in the middle of a sea of trash. The trunk was at least an inch round and it rose up into a perfect canopy of leaves at the top; a topiary with a perfect sphere. I remember it being large when I was a kid, but everything is large when you’re small. The tree was now covered with hundreds of ladybugs. The branches and leaves were coated, a humming sea of red dots flowing all over the heap tree. Occasionally one would fly away. We were transfixed by the sight. We waded through trash to get a better look. We were awestruck. It was magical. It was Disney. It must have a meaning. We stared until nightfall, when the calls of our parents for ‘dinnertime’ urged us home. The next day we went back to see the ladybug tree, but they were all gone. No trace of them. As quickly as they came, they had disappeared. Had we dreamed it? Could we all have had the same dream? The tree seemed so unremarkable now that it wasn’t swarming with life. Soon the tree was gone, too, crushed by some additional metal waste that was soon our “mountain” on The Hill, which the boys would climb to go “hunting” and bring “food” back to the fort. We stopped playing on it when someone cut their leg pretty good on some rebar. Years later it was cleared it away and a house was built there, but it could never be as good as our fort.